When needing a solution for research and development tasks, The Rohde and Schwarz CBT32 Bluetooth tester is an ideal choice. Known for its versatility and ability to perform numerous RF and audio measurements, the comprehensive tester is suitable for development, production, and verification environments. It features high speed capability for high throughput production and integrated spectrum measurements, and gives the user flexible options for connections without any additional spectrum analyzer requirement. The R&S CBT32 is specifically designed for performing Bluetooth RF tests in hopping and non-hopping mode channels. It allows various measurement functions and a wide range of statistical monitoring. Professionals are easily able to define desired tolerances and the sequence to be used during the measurements. By defining the required number of packets, the device can display averaged minimum or maximum traces. This is in addition to the power, modulation, and spectrum traces displayed. Test technicians will appreciate its ability to measure the required values on an active connection without adding spectrum analyzers to the set up. The tester utilizes the parametric measurement concept. This advanced technology allows measurements to be performed in hopping mode or single frequencies using any desired packet types and bit patterns required during test. The large graphical display of the CBT32 Bluetooth tester enables users to view traces in real time. The switchable markers allow for analyzing the traces in comprehensive detail. Measurement parameters and other settings are easily varied using the rotary knob, allowing for quick adjustments to the level and the frequency of the measurements. It is also used in changing the positions of the marker. Modulation or spectral characteristics can be precisely measured at different values of transmit power. The power control feature in the TX measurement menus assist the technician efficiently when measuring the spectral characteristics. The R&S CBT32 also stands out with its advanced, versatile features for remote control. Its special design allows for easy integration into a variety of rack space configurations. It also can be optimized depending on requirements to enhance throughput on the production line. In a Bluetooth piconet connection, the tester serves as a master, and the DUT serves as the slave and gives users a wealth of specific information about the DUT in an easy to assimilate format . In the audio mode, the tester establishes both asynchronous connection link (ACL) and asynchronous connection-oriented link (ACO) to the DUT. The embedded technology of the CBT32 uses parallel signal processing as standard and is easy to use. Its high production abilities also make it ideal for a variety of uses in a production line environment. It has the ability to measure modulation, power, frequency drift, and frequency accuracy in a single test cycle, which ultimately increases productivity for the technician. In summary, The R&S CBT32 makes for a quality, all in one solution when a Bluetooth tester is required. 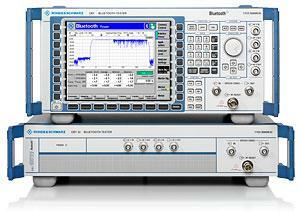 The overall ability and track record of performance for the Rohde and Schwarz product line is well known throughout the industry. This entry was posted in Site News and tagged Rohde & Schwarz CBT32. Bookmark the permalink.